Here you will find detailed information about the different areas in which you can get involved on this Conservation & Environment project. Volunteers begin the Conservation project by becoming certified as a PADI Advanced scuba diver. If you are already certified you can take the Rescue Course and further specialised dive certifications. Once your training is complete, our resident Marine Biologist, together with our scientifically trained staff, will teach you to understand the terminology, procedures, and methodology of reef and coral surveys. You will learn how to correctly identify indicator species, their habitats and behaviour. This will include training in environmentally friendly diving and survey techniques. You will then play an active role in data collection, analysis and entry. You will conduct research studies and surveys on several active research projects around the islands surrounding Krabi and Ko Phi Phi. The information we gather is shared with local government and non-government organisations. This is vital to the conservation of the marine and coastal areas around Thailand, especially those with protected status. Our data is also entered into the Reef Check International database. In addition to the research dives, we work in partnership with Project Aware's Dive Against Debris Survey. Volunteers receive training in safe and environmentally friendly techniques for ocean debris removal, collection and resurfacing. We then conduct salvage dives, collecting debris and trash from the reef. This may involve cutting free a snagged fishing line, releasing fish from abandoned fishing traps or simply bringing up discarded items to the surface. Our conservation programme also involves some very important land-based activities. These are vital to conserving the marine and coastal ecosystems of the region. We are involved with the UNESCO-funded Ocean Conservancy Beach Debris Survey. We undertake weekly beach, island and waterway clean-ups to ensure that these areas, some of the most beautiful beaches in the world, remain pristine. This also ensures that trash does not enter the ocean, in turn becoming hazardous to the health of marine life and the entire ecosystem. Volunteers are trained in environmentally conscious and locally sensitive methods of debris collection, sorting and disposal. This can involve participating in school presentations and leading local school children on beach clean-ups. Data from these activities is recorded and analysed. 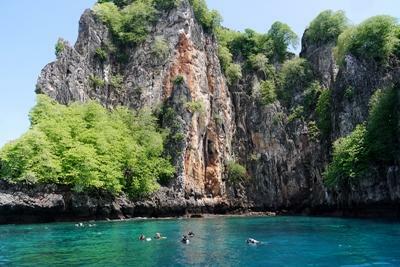 The Andaman Sea coast is characterised by deep oceanic waters and a narrow, rocky and coral reef, with a thick mangrove belt protecting the coastline. Mangrove forests are among the most productive and bio-diverse wetlands on earth, yet these unique coastal forests are among the most threatened habitats. Studies have shown that this area of Thailand has experienced massive ecosystem degradation due to the natural effects of the 2004 Asian tsunami. This is compounded by the impact of human activities, such as the replacement of the mangroves by shrimp farms and other natural forests by rubber and oil palm plantations. Healthy mangrove forests are key to a healthy marine ecology. Help is needed to monitor the mangrove forests to prevent further destruction and assist with reforestation projects in this beautiful yet fragile area of Thailand. We work in partnership with the Department of Marine and Costal resources and with local villages. This involves seed collection, growing saplings, tree nursery care and maintenance. Volunteers also plant native and food-producing trees and plants in designated zones within deforested areas. Another area of work includes creating nature trails and building habitat corridors for endangered and indigenous animal and bird species. We also construct buildings using environmentally friendly practices and locally-sourced materials. Each month we organise at least one community and one school event. These events are designed to educate the local community about environmental issues, in a fun, accessible setting. 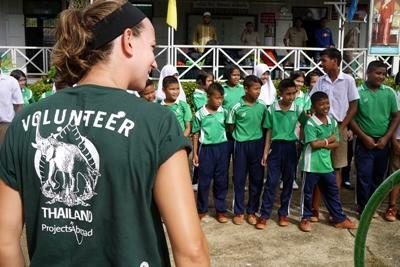 Volunteers participate and develop our Environmental Education Programme. This involves attending local schools and developing awareness through teaching and play. We also organise community events and encourage local people, businesses and tourists to adopt environmentally friendly practices. Our volunteers also get the chance to attend environmental-based practical workshops led by local people and internationally-recognised experts. These might include topics such as, agro-forestry, wildlife rehabilitation and release, sustainable building, harvesting, reforestation, creating nature corridors, identifying local food bearing plants and many more. Volunteers can also attend presentations given by guest speakers such as our in-house scientist, the Association for the Protection of the Environment, Chiang Mai University, Staff from the Recompression Chamber, the Fisheries Department and the Department for Marine and Coastal Development, to name just a few.